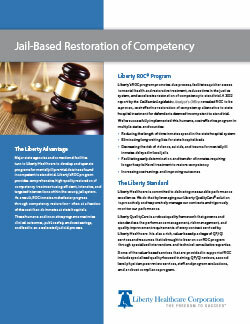 Liberty’s ROC® program was singled out by a 2012 report by the California Legislative Analyst’s Office as a proven, cost-effective restoration of competency alternative to state hospital treatment for felons deemed Incompetent to Stand Trial. 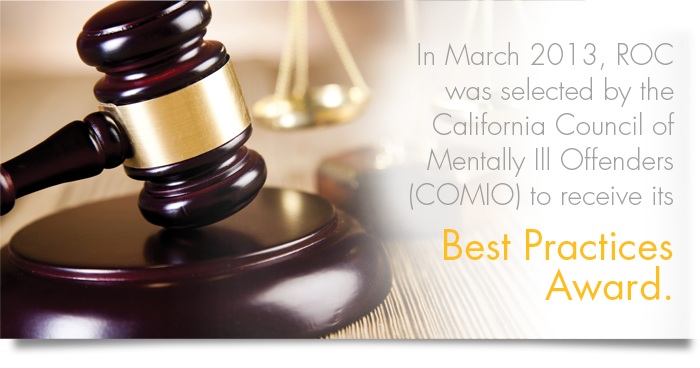 ROC has been called a success by prosecutors and public defenders alike because it promotes due process, facilitates quicker access to mental health and restorative treatment, reduces wait-lists, reduces time in the justice system, and accelerates restoration of competency to stand trial. One metric of our success includes the reduction of the state hospital per patient average cost of $81,000 to $15,568 for one state client. Another metric showed restoration was completed in an average of 57 days as compared to the state hospital average of 180 days. Shortly after the first program was opened in California, a second followed. Liberty has worked with multiple states and counties to elucidate the value of Liberty’s ROC program, educate advocates and attorneys of its humane aspects, and advise legislative changes that may be needed. Similar programs to those we operate in California are in various stages of development in a half dozen other states.